Yuktix Technologies - Blockchain Technologies - One of the first member of DataBrokerDAO. 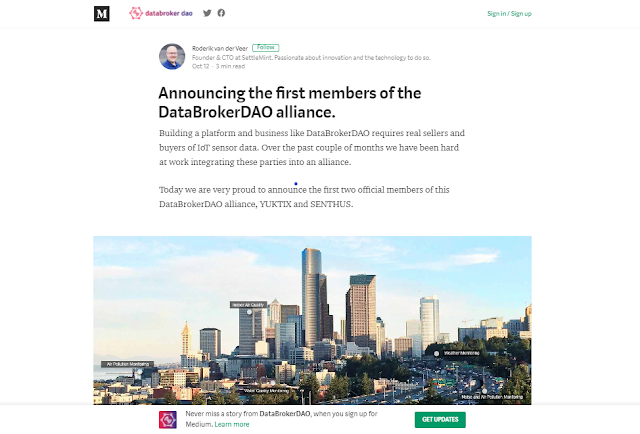 Yuktix Technologies is working with DataBroker DAO that is using Blockchain Technologies to record and maintain usage of sensor data. The current discussions of smart cities assume an array of sensors deployed at a granular level. To do the smart things and derive the benefits of data driven decisions, we need a large number of sensors. It is heartening to see then an attempt to invent a unique ownership model for sensors deployment. There has to be a revenue model in place to power the sensor deployments. That is especially needed for use cases that today are not readily identifiable but incur a huge social cost. Air pollution is one such example. One way is to assume that municipalities and local government would do it. However what if we can create an ownership model where the society can participate and benefit as well? What if we paid people owning the sensors every time their data was used? That should encourage the people to install and own sensors. However the biggest issue with such a model is question of trust. How can I trust my aggregator to pay me the right amount? How do I know that right usage data is recorded and is not tampered with? How can we ensure that for all the micro payments that are due to a sensor owner? Enter block chain. The technology is most familiar from crypto currency use case but it can also be applied to maintain tampering proof ledgers. Yuktix SensorDB is a IoT device management software that lets you manage IoT devices, store device data, run different computations algorithms, set alerts and notifications using Email or SMS.